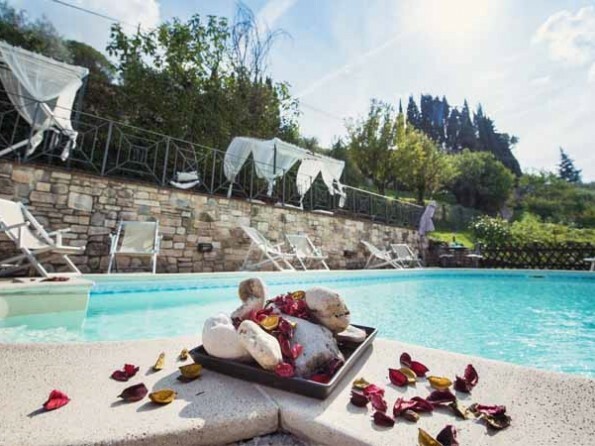 1 Bedroom Country House Apartment with Private Spa Room in Italy, Umbria, Perugia26.0000Minimum stay 4 nightsRomantic stay ! Bonfigli luxury and romantic apartment rental sleeps 2+2 and sq.mt. 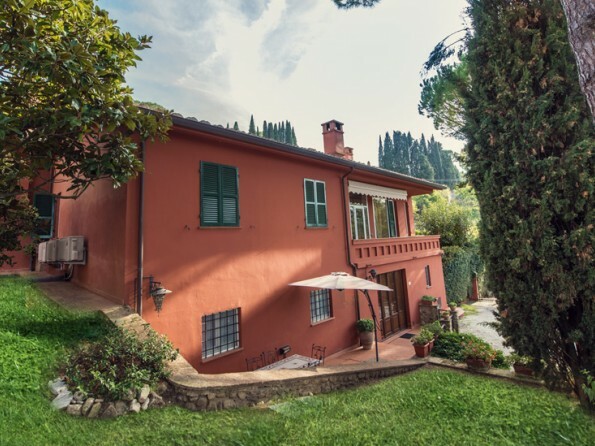 50 with exclusive private SPA room,AC,fully equipped kitchen,sky stars on the ceiling of the bedroom, eco pool with salt and heated water, playground, area barbecue, fiber speed wifi,garden,herbs garden...all at only 15 minutes walking medieval center of Perugia! 7 nights just € 770,00 all inclusive !!! 14 nights just € 1400,00 all inclusive ! 21 nights just € 1850,00 all inclusive ! 28 nights just € 1990,00 all inclusive ! 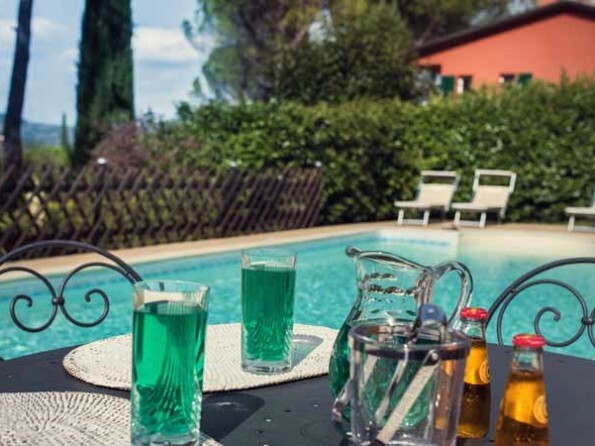 Set on top of a hill surrounded by pine and olive trees, Villa Nuba is an elegant country house 15 minutes walk from the beautiful town of Perugia where you can wake up to the sound of birds chirping, spend the day dipping into the saltwater pool and dine al fresco as the sun sets. Simply enchanting. Once a historic farmhouse, Villa Nuba has been lovingly converted into three stylish and romantic apartments where you can escape from the stresses of everyday life and immerse yourself in complete rest and relaxation. 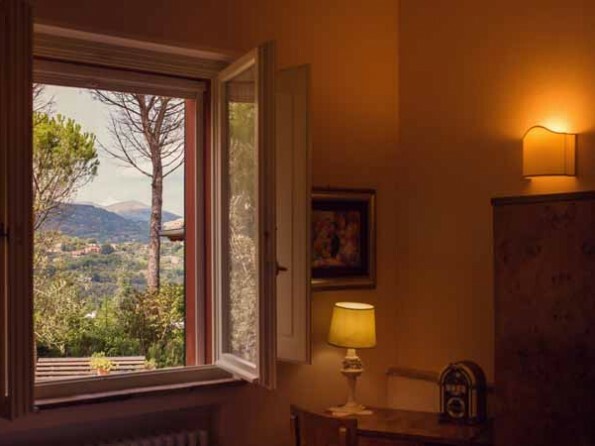 The Bonfigli residence, with its wonderful private spa, is delightful, the shared gardens are perfect for enjoying a book or a siesta, the Umbrian countryside is quiet and unspoilt, and the historic and artistic attractions of Perugia are just a short walk away. 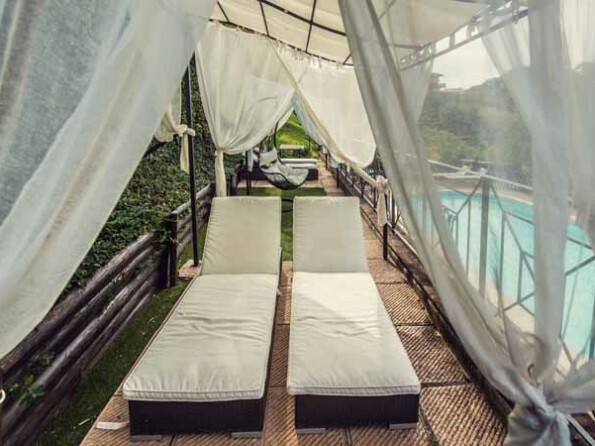 Whether you’re a couple, a family or a group of friends, Villa Nuba would be an idyllic setting for a traditional Italian retreat. Known for its cultural treasures, its prestigious university and its mouth-watering local delicacies and fine wines, Perugia is a beautiful cosmopolitan city with plenty to offer its visitors. There is a vibrant selection of bars, restaurants, cafes and clubs to explore, not to mention the shops, theatres, parks, museums and festivals. 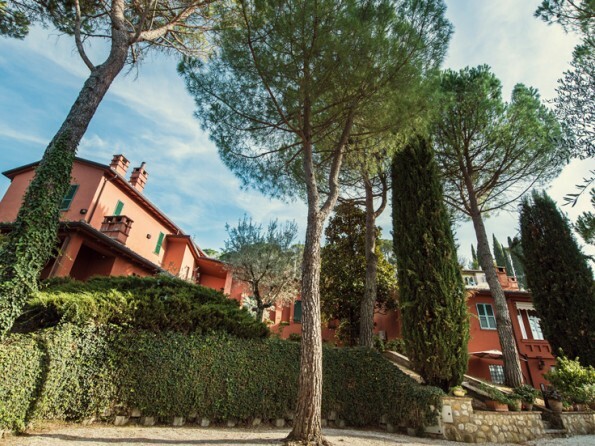 Or outside the city you can hike in the hills, discover a myriad of picture-perfect villages and visit the Adventure Park in Ponte Felcino, home to river canoeing, tree climbing and bike rides. And if you fancy a day trip then Perugia is perfectly located for visiting Assisi, Spoleto, Spello, Gubbio, Todi and Orvieto, or indeed the big cities of Florence, Rome, Siena and Pisa. Travelling East on the SP327, join the E45 heading north to ‘Cesena’. Stay on the E45 and take the Ponte Felcino exit. Stay on the exit road as it sweeps left under the E45 and take a right turn onto Strada Molinella, a tree-lined dual carriage-way. After about 2km veer right onto a single-lane slip road, which sweeps counter clockwise up and over Strada Molinella. Immediately take a right (signposted ‘Perugia’) onto Via Eugubina. After about 4.5km (and after passing a yellow petrol/gas station on left), turn right where you are immediately faced with a triple fork in the road. If you pass a second petrol station on the left you have gone too far. Take the extreme left hand un-paved road and after a few hundred metres, take the ramp at the right hand edge of the road to arrive at the gates of Villa Nuba. 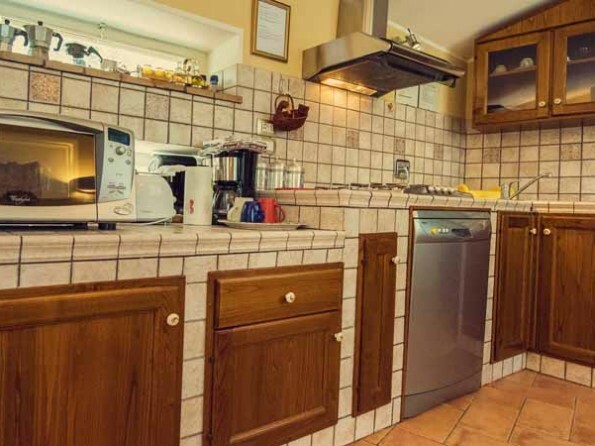 Bonfigli apartment has one double bedroom, a living room with a sofa bed and a kitchen, a bathroom and a private spa. The main suite has a mesmerising ceiling which transforms from plain white during the day to a magical constellation of stars at night (can you think of anything more dreamy?) and the spa is equipped with an aromatherapy/colour therapy steam bath, a Jacuzzi and a hydro massage shower. 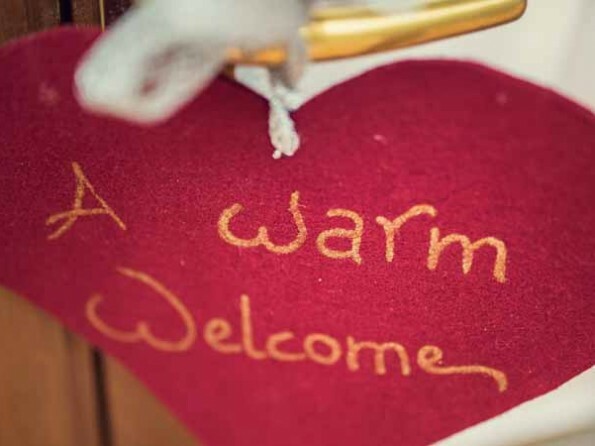 The apartment has everything you could need for a comfortable stay, from high speed WiFi and air-conditioning to a dishwasher and washing machine. The apartment boasts a private patio with sunbeds and a garden table/chairs, and within the shared grounds you will find a saltwater swimming pool, a BBQ area, a children’s playground and a vegetable garden. There is a herb garden outside the apartment which you are welcome to help yourself from (thyme, basil, mint, rosemary, sage etc) when you are cooking. Minimum stay is 2 nights. The owners live in the main villa and are always discreet yet available to help. 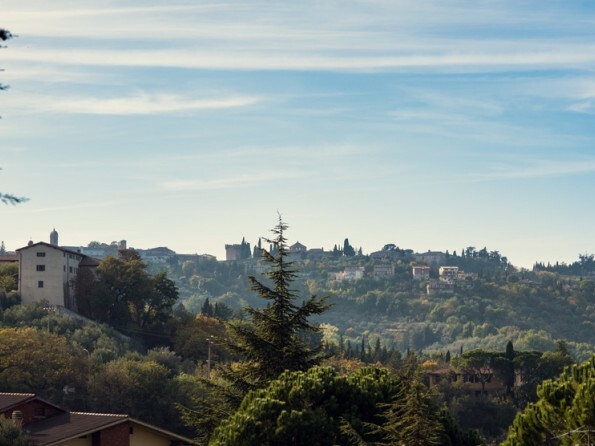 Perugia is in the middle of the Italian region of Umbria so it's perfectly positioned for exploring central Italy which is where many of Italy's most famous towns and cities are situated, including Perugia, Assisi, Orvieto, Florence, Siena, Pisa and Rome. 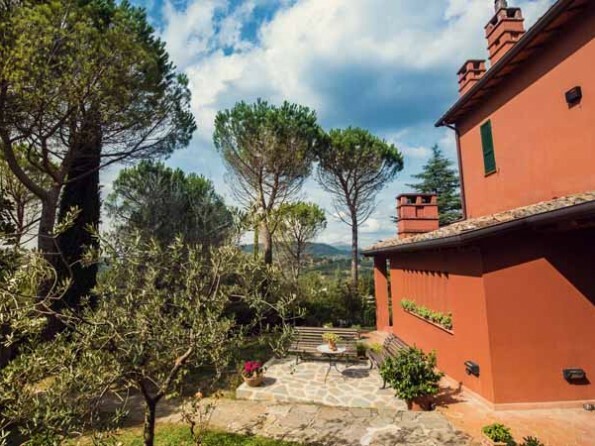 Although the villa is in a rural hilltop setting, it is also just a 15 minute walk to the beautiful medieval town of Perugia with its shops and restaurants. There's a local bus stop 150m from the villa, with the central bus station just 2km away. Your nearest eatery is a great pizzeria just 250m from the villa. The central train station is 3km away. Lots of shops, markets and restaurants within a couple of hundred metres. The owners are very happy to offer advice on places to go, things to visit, restaurants to try, food, wine, olive oil, medieval towns - you name it! They will also give you a Villa Nuba Gold Card which gives you preferential rates in some of the local restaurants, trattoria and shops.